Gypsy's is located in Sea World and is run by an Australian owner. 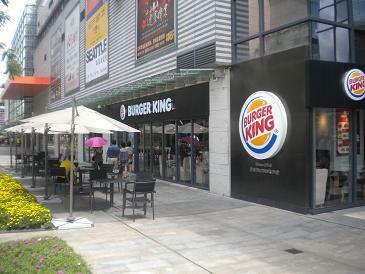 In my opinion the best all around restaurant in Shenzhen, everything on the menu is very good. 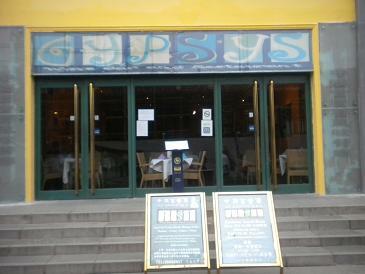 For the first several months that I lived in Shenzhen I would eat at Gypsy's several times a week. The Cruise Inn is ideally located in the middle of Sea World (The Shekou Square) inside The Minghua (a old cruise ship landlocked) - surrounded by numerous international restaurants its a great place for visitors who want to make sure they have easy access to western food choices. I've never stayed there, but I heard from co-workers that it can be noisy from the square if there are late night activities and the rooms are small, typical of a cruise ship. 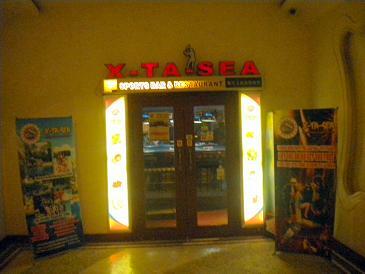 X-TA-SEA is a sports bar located in Sea World, inside the cruise ship in Shekou. X-TA-SEA offers a wide selection of classic American sports bar fare including chicken wings, pizzas, sandwiches with a number of beers on tap. Most major sporting events can be seen on the projection tvs in the bar. If there is a sporting event you must see, ask the staff. They can sometimes record games in the US and stream them on the tvs. The owner Bill is from Chicago and is often found hanging out at the bar each evening with his friendly dog. Brian's Favorite Menu Items: Chicken wings, Ribeye steak sandwich with philly cheese sauce on side. 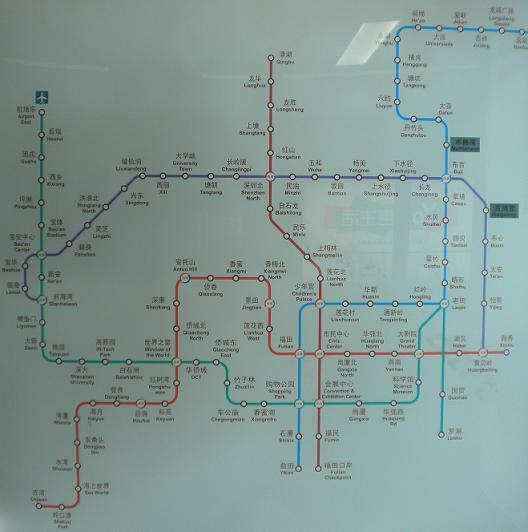 The Shenzhen Metro significantly expand in mid-2011 and now contains 5 metro lines with over 100 metro stops all over Shenzhen. 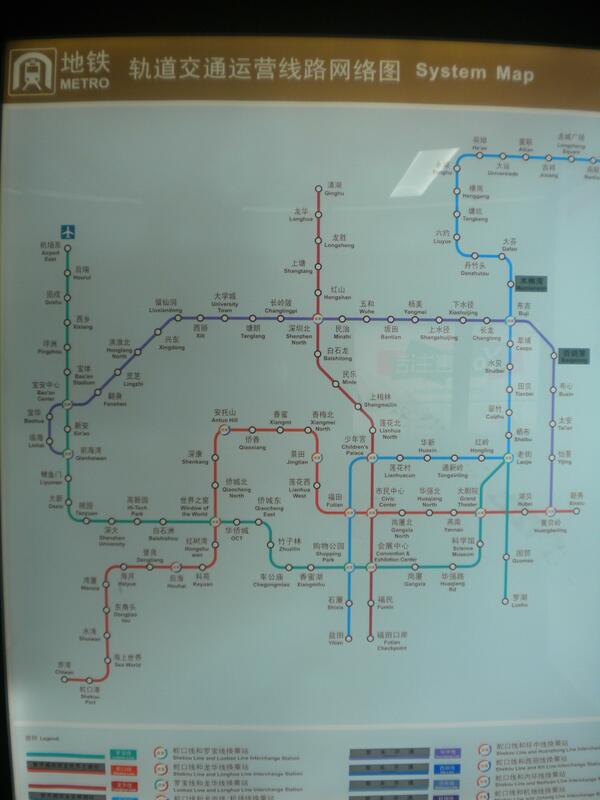 With an English metro map it is now much easier and cheaper (than a taxi at least) to move about the city. 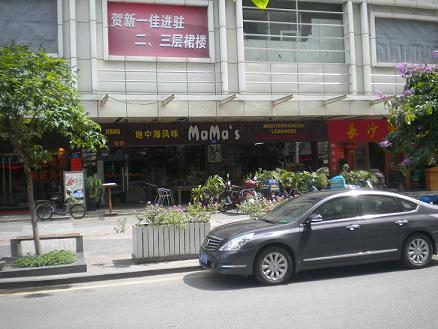 Mama's, located in old Shekou, other a wide variety of dishes including pizzas, classic Mediterranean fair, Lebanese, Italian, etc. While I lived in Shekou I would order a Doner kabob at least 1/week as its fairly inexpensive, but very tasty. 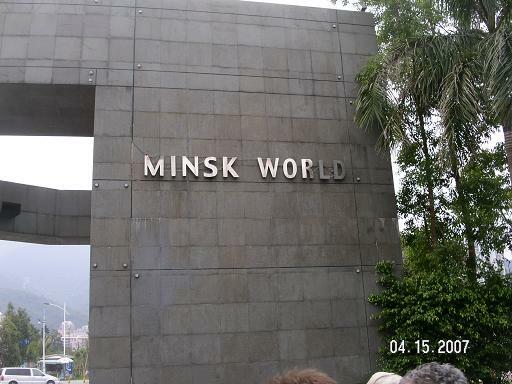 Minsk World is a tourist complex built around the old Soviet Minsk aircraft carrier. Its a reasonable attempt at creating something worth visiting, and most expats may get a good chuckle with a visit. 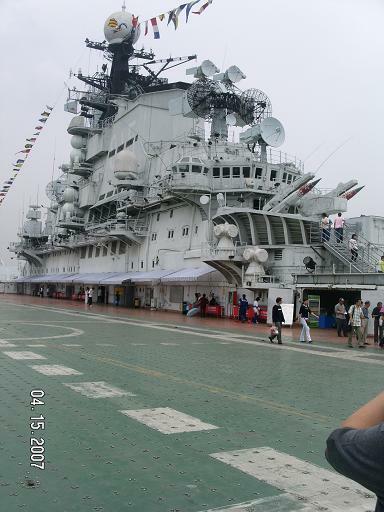 The actual Minsk aircraft carrier is really the only thing worth seeing in the complex. 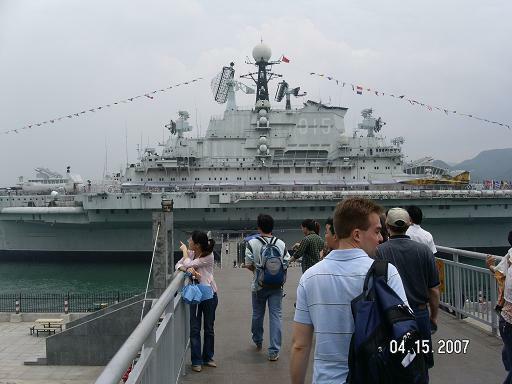 There are a few other pieces of military equipment, sovenior stores, and eateries, but their really built around the aircraft carrier. 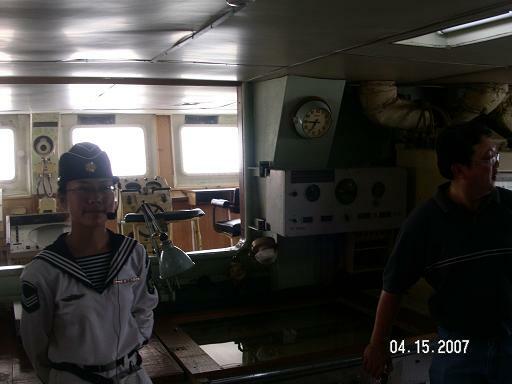 The aircraft carrier was in a surprising state of disrepair. The aircraft on its deck had flat/dry-rotted tires. The control room appeared to have all had all the equipment pulled out with older equipment hastily placed in the room and non-functional. 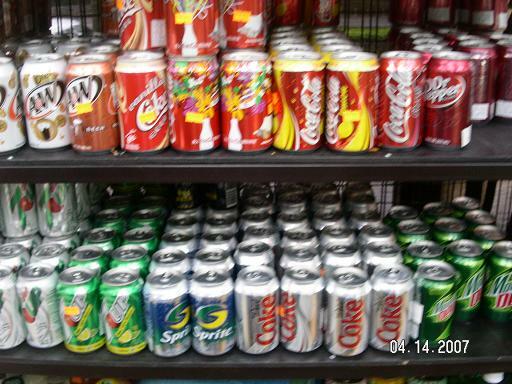 If your craving international groceries in Shenzhen, then Charlies is probably the best all around location to shop. 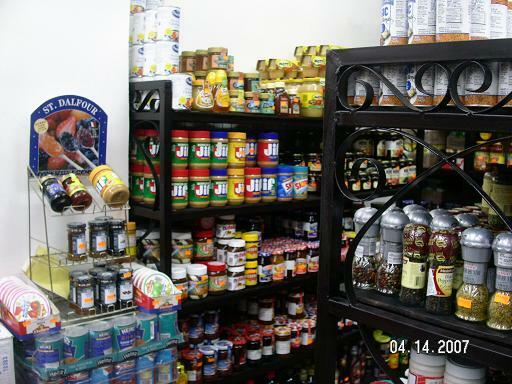 Located at Shop 8, 1/F Bitao Center, Taizi Lu in Shekou this small shop is packed with imported foods that will probably satisfy the most homesick shopper. 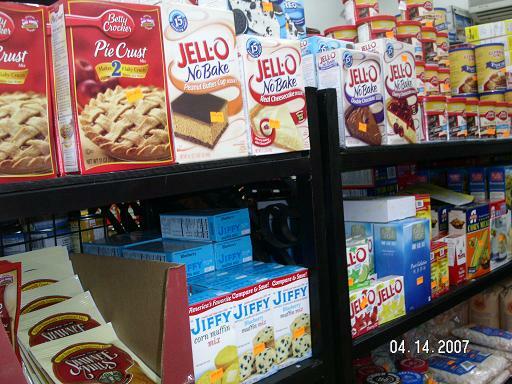 We found Charlies a great place to find reasonably priced diet soda, peanut butter, chips, granola bars, soups, spaghetti sauce, pasta, cookies, peanut butter, cheeses, etc. Our groceries while living in Shenzhen mainly came from Charlies and Hong Kong grocery stores. 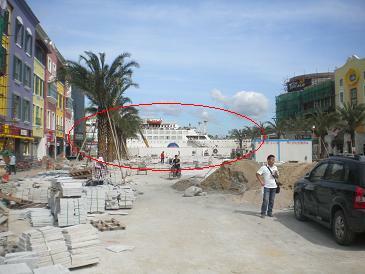 The Shekou Ferry is located at the end of Nan Hai Boulevard and the southern tip of Shekou. The ferry has regular ferry service to Hong Kong Island, Macau, Hong Kong Airport, and Zhouhai. Upon arrival at the Shekou Ferry terminal there you can either get a gypsy (private) driver or a regular taxi car marked with the official red/grey cab color. We would recommend not accepting rides from any gypsy driver at the ferry terminal as they're prices can be 2x to 5x what a regular taxi driver costs. You may be harassed by gypsy drivers as you make you way through the terminal exit who may even speak some broken English. We would recommend proceeding straight to the taxi stand line in front of the terminal and wait at the stand for an official taxi. Remember nearly all taxi drivers in Shenzhen cannot speak English so make sure you have a plan to communicate with them (either paper with written destination in Chinese or be prepared to speak your destination in chinese). Welcome to Shenzhen Travel Guide. 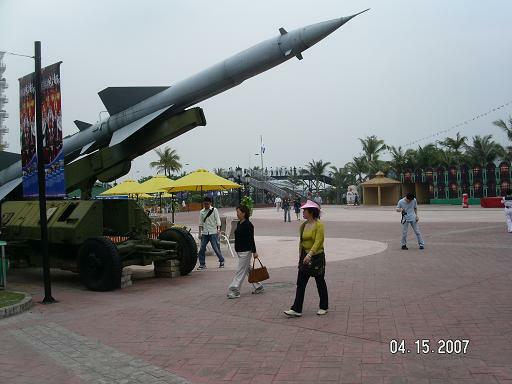 This site provides information on where to stay and eat, what to see and do in Shenzhen China. We are regularly added content.